While it was extremely satisfying to hear Sam tell Jon the truth about his heritage, Jon’s immediate response to that truth raises some questions. His first reaction is to reject his right to rule, saying he gave up being a king when he bent the knee. As the good, law-abiding citizen he has always been, Jon considers it treason to think anything different. Sam’s response to that is fairly epic: “It’s the truth. You gave up your crown to save your people. Would she do the same?” This revelation comes just after Sam tells Jon that Daenerys executed Sam’s father Randyll Tarly and brother Dickon Tarly for not bending the knee. She lacked the mercy Jon has displayed several times in the past, when he was put in the position of deciding whether to execute people, or spare them. And Jon apparently had no idea Daenerys was capable of such ruthlessness. Jon must now decide whether he should continue to obey Daenerys, or announce his heritage and have his people follow him as king and potential heir to the Iron Throne. A lot of his decision may boil down to whether he thinks Daenerys would be a worthy ruler, and whether she would be selfless enough to sacrifice for her people, or whether she values power above all. In an eight-season show, Jon has spent less than a full season with Daenerys, and he’s missed a lot of her most dramatic and serious choices — murdering the Khals of the Dothraki, crucifying slavers, and burning a witch to death for betraying her, just to name a few. So what does Jon even know about Daenerys? Before he sailed to meet her in Dragonstone in season 7, he held court in Winterfell to discuss his plans. During this discussion, it’s made clear that Jon, like most of Westeros, is well aware of the poor reputation the Targaryens share — particularly Daenerys’ father Aerys II Targaryen, aka The Mad King, who nearly burned down the Seven Kingdoms before he was stopped. 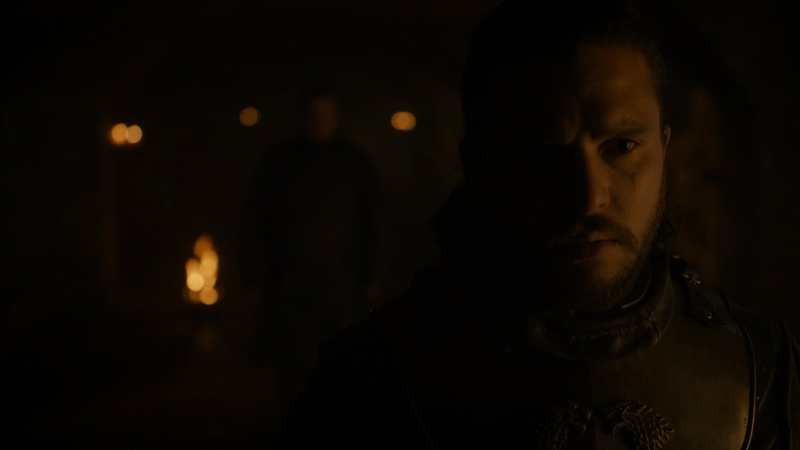 Still, when Jon meets Daenerys, he mainly sees the good in her, saying, “You could’ve stormed King’s Landing… But you didn’t, which means at the very least, you’re better than Cersei.” That’s a low bar Jon is setting for Daenerys, considering Cersei’s many cruel acts throughout the show, including blowing up the Sept of Baelor in season 6, killing hundreds. The showrunners did foreshadow in season 7 that Jon might ultimately need to call Daenerys’ character into question — and that she might be more bloodthirsty than he thought. She kills the Tarlys in season 7, by having Drogon burn them to a crisp, in an emotional scene that has Tyrion pleading with her every step of the way to show mercy. When she returns to Dragonstone, Jon remarks, “You weren’t gone long.” Daenerys says, with an air of satisfaction, “I have fewer enemies today than I did yesterday.” Her words vaguely trouble Jon, but he doesn’t really know what she means until Sam tells him in this episode. Season 7 marked a test of wills where Daenerys and Jon initially approached each other without much trust. They slowly grew to admire each other’s courage and honor. But at this point in the story, while sequences like their waterfall interlude are pushing the romance of their connection, there’s still plenty they don’t know and haven’t confronted about each other. Sam’s latest revelations are bound to have a significant impact on Jon’s decisions going forward. In some ways, it would be convenient for Jon to reject Daenerys’ rule, given the pressure he’s under from the lords of the North. They don’t want her around either, and their various complicated histories with House Stark have left his alliances shaky enough without the question of an interloper demanding his subservience. On the other hand, as he pointed out, he never wanted to be King in the North, let alone King of Westeros. But he’s also always shown that duty comes before his own desires. Which is why he has to decide how to balance his duty to the Seven Kingdoms with the duty he owes her, both as a loyal bannerman and a lover. It’s a question worth posing to the audience as well: after all we’ve seen of Dany, would she be a fair, just, and wise queen? Jon’s initial answer seems as good as any: at least she’s better than Cersei. But now that Jon might be up for potential ruler, maybe Westeros finally has an even better candidate to consider.